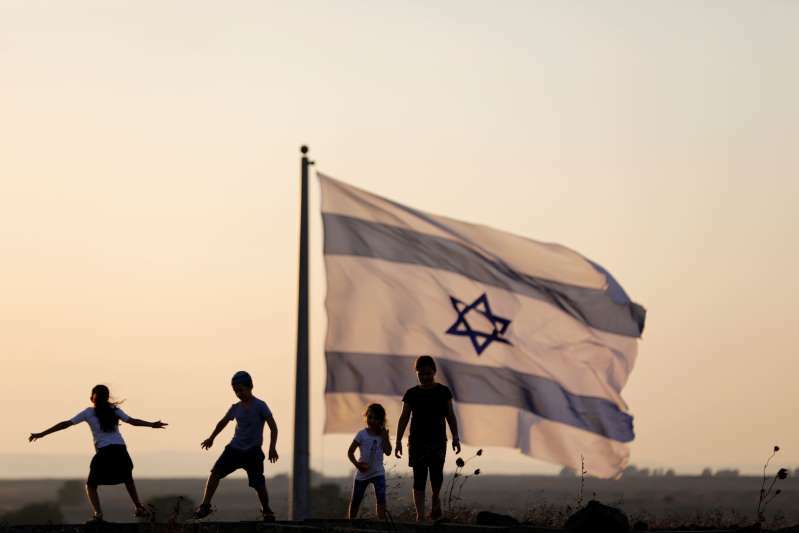 Israeli kids play beside an Israeli flag next to the Israeli Syrian border at the Israeli-occupied Golan Heights, Israel, July 23, 2018. A Syrian warplane that Israel shot at on Tuesday was hit and crashed on the Syrian-held side of the Golan Heights, the Israeli military said. "It was shot down and it crashed," Israeli military spokesman Lieutenant-Colonel Jonathan Conricus told reporters. "We do not have any information so far about the pilots. I do not know of any reports of parachutes being spotted, and we do not know if any pilots have been retrieved." He confirmed that the plane was Syrian, not Russian. "The only thing we know about the aircraft is that it crashed, most likely in the southern part of the Syrian Golan Heights," he said.